Welcome to our Shopping Cart, your shop for our integrated concept. Total picture, panorama and a window. Our Shopping site can give you a total picture, panorama and a window on what we can do to your Company. From here, you can have a panorama and window on our entire Concept. InterConsult21 is not a closed directory. Categories and "Features / Products". We have simplified and integrated our delivery in few categories. Non Profit Organizations are Free. Integrated "Features / Products" under categories are included with short descriptions. 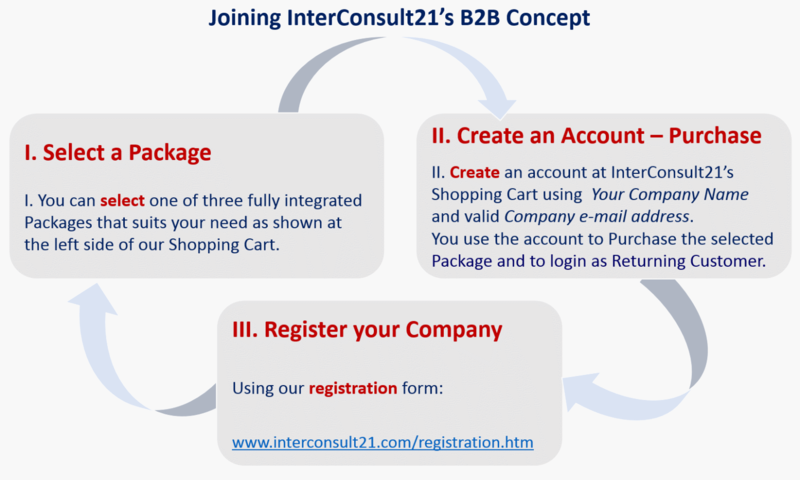 InterConsult21 links the World together and makes it possible to do straight Business-2-Business professionally. Any Company or Organization in any Business, Service in any City in any Country in the World can establish contact and Business in its field of Business or Service in its target geographical marketing segment locally, nationally and globally. (Far East, Middle East and Africa, Europe, North and South America and Islands and other Nations). is Business oriented. It spreads over more than 50000 Websites. We will promote, marketing and add your Company / Organization within 15 days after the approval and successful processing of your payment. Once we add your data, your Company / Organization will be visible as stated on the delivery of each Package. More About Us.